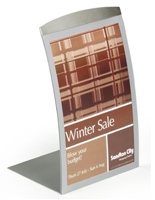 This sign holder is one of our main retail signage solutions! Retail signs are stocked by the 100's in our large warehouse, order today we ship today! 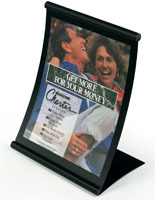 This photo holder is made of quality aluminum and features a black, powder-coated finish; the black finish easily coordinates with any environment. 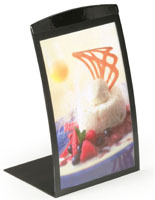 This photo holder, also known as a picture display, features a curved design for a more modernized appearance, compared to traditional picture frames. 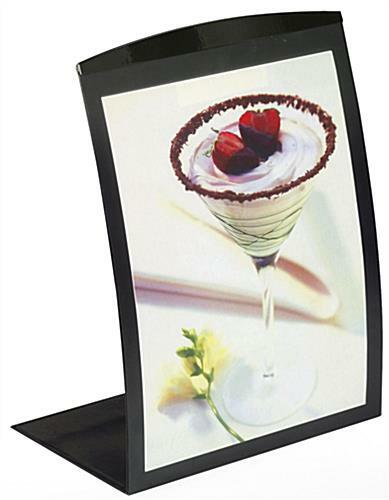 The picture display, photo holder can be used to advertise pictures, notices, artwork, advertisements and menus. 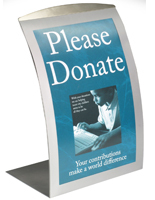 The photo holder is ideal for use on store counters for displaying advertisements, or even in hotels to advertise an upcoming event. 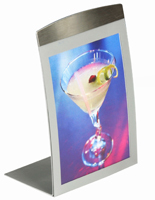 No matter where it is placed, the photo holder is sure to add an upscale appearance to your graphics. 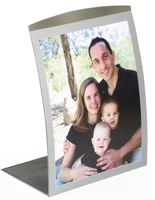 This photo holder also features a magnetic frame for easy access to the content beneath. Simply flip up the non-glare lens and place the 8-1/2"w x 11-1/2"h print underneath it. The magnetic lens holds the content securely in place. 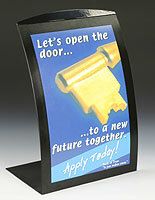 Maximize your advertising capabilities with this photo holder! We also sell the photo holder in a silver finish as well.